Even though I have been living in Australia for more than 20 years, I still love Malaysian food. I guess you can take the girl out of Malaysia but not the Malaysian out of the girl. 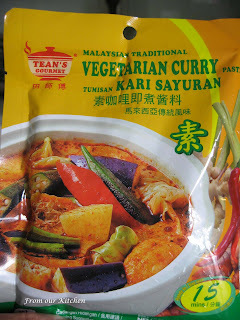 These days it is so easy to cook a Malaysian curry dish, with ready-made curry paste to suit meats, seafood or vegetables. I like this particular brand of paste (from Malaysia) and have tried the different varieties from curry chicken, sambal tumis, curry laksa, prawn mee and tom yum. For a change, I cooked a vegetable curry - baby eggplants, round beans (french beans), cabbage, carrots and fried bean curd (tau pok). 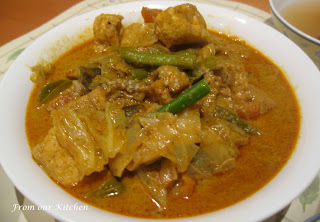 I love plenty of fried bean curd in my vegetable curry. Delicious with a bowl of basmati rice! 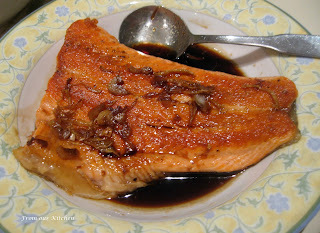 I also cooked a Salmon in Teriyaki Sauce for dinner. Isn't it true Jan... we South East Asians can't do without our curries.